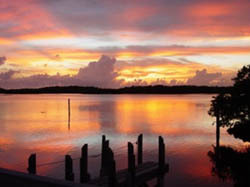 The West Coast of Florida and the Gulf of Mexico are famous for our sunsets! But the sunsets in the Everglades are particularly spectacular! Want something special to do in the evenings? 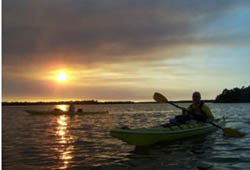 Join us for a guided sunset tour and experience sunset on the water as flocks of birds return to their nightly roosts. Bring your camera! 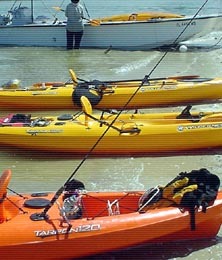 Water, head lamps, guides and all safety equipment is provided. Reservations are suggested, but late-comers are always welcomed. If conditiona allow, we launch from shore and paddle the 10,000 Islands and Chokoloskee Bay. As the sun begins to set and the sky begins to be painted with yellows and reds, flocks of bird return to their roosts. It is a wonderful spectacle to witness. During the week before the full moon, we offer FULL MOON PADDLES. These are fabulous especially if you experience the "Rocker" ... To learn more about these SPECIAL TOURS, click here. The Islands and Bays make for a great tour, but many times, we will trailer the kayaks to the mangrove tunnels for a sunset tour. The moonlight shimmering through the mangroves is a very unique experience. As well, the flocks of birds returning to their roost make the tunnel tour particulary special. Before you tour, relax with us at JT's and enjoy dinner at a local restaurant afterwards. This tour is $59.95 per person.